Forty Toes: GIVEAWAY Palm Tree Princess! Who wants a 25 DOLLAR GIFT CARD?????? I have been buying from her since SM was just a baby! I wish I had pics to share! So I was OVER the MOON when she asked for me to shoot pics for her new SPRING COLLECTION! So I am using Rafflecopter to run the GIVEAWAY! Just click the link below to enter! GIVEAWAY ends on Feb 27th! Thank you for the giveaway! I LOVE your work! Thank you for the giveaway! Such a huge PTP fan!!!!! Her work is amazing! 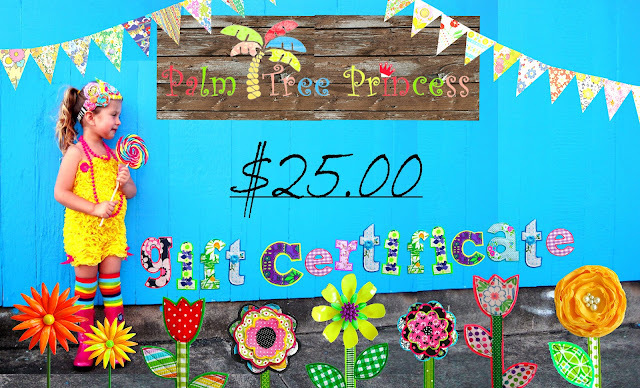 Having trouble liking Palm Tree Princess on FB via the link. It says could not retrieve ID for specified page please verify correct href was passed in. Wow, these pictures and dresses are incredible! Thank you for sharing such a talented designer in a generous giveaway! Wildflowers Peasant Tie Dress is beautiful! I would love to own the Sweet Lil' Fawn BUBBLE ROMPER! Thank you for all the NEW fan LOVE! I love the Sweet Lil' Fawn BUBBLE ROMPER! So many to choose but I definitely love this Pretty in PINK MATRYOSHKA DOLL dress! I would Love to witn the MADEMOISELLE - Sleeveless Kimono from her new Spring line!! too cute! I love PTP, Kumari garden dress is at the top of my list. I would get the baby romper with the punk deer to match my daughter's stuffed nesting dolls from PTP. Such a great giveaway! I love the entire New Spring Collection! love the PINK ICE - Tiered Twirly Dress!! I would love to own her BIJOUX -- Tiered Twirly Dress!! Super cute!! I love everything from PTP! The new Spring skirts are FUN! Love the Girls Rock skirt, so fun! I love the Sweet Lil' Fawn Bubble Romper. So many are cute but I LOVE the TANGERINE DREAM - Tiered Twirly Dress It would look so cute on my daughter and it's not like anything she owns! Love the Seaglass and Lemonade dress. I would honesly love to win anything! everything is so stinking cute!!!!!!!!!! I have been dying to buy the Kumari Garden twirl dress! Her fabric choices are amazing! I LOVE her Mademoisele! I love the Papaya Sorbet dress. Actually I love them all, but that is one of my favorites. I LOVE THE TANGERINE DREAM DRESS!! LOVE all of her clothes!! So unique and cute!! Ohhhh, I love the dockside sea shorts! Those are so, so cute!! Love the Sea Beauties Mermaid Skirt! love the apron knot and also the kimono style! Love Happy Hills peasant dress! I love the cupcake shorts and the happy hills dress! I would LOVE to own her seaside tiered twirly dress. It's so adorable!!! Love the Native Rock & Roll Maxi Dress...!!!!!!!! I love the TANGERINE DREAM - Tiered Twirly Dress. But it is all so beautiful! Oh my goodness I so love this shop and her designs!!! I would be happy with any of her dresses but this particular dress is so eye pleasing to me. As a photographer and Mother of two I can see buying many cute girly items here! Oh I have had this as a favorite dress for a month now! http://www.etsy.com/listing/73945942/caribbean-dream-tiered-twirly-dress Love Dena designs and PTP does an amazing job of picking the coordinating fabrics from this top designer. I'm sure she could sell those fabrics with your photography. i have no favorites! would be pleased with anything!!! I would love the Mademoiselle sleeveless kimono dress! Thank you! I would love the Pink Ice and Caribbean Dream :) Gorgeous items!!!! I love the Tangerine Dream dress! Thank you for the giveaway. Such cute little creations!!! I love all of the designs that are made!! And I hope I win! !